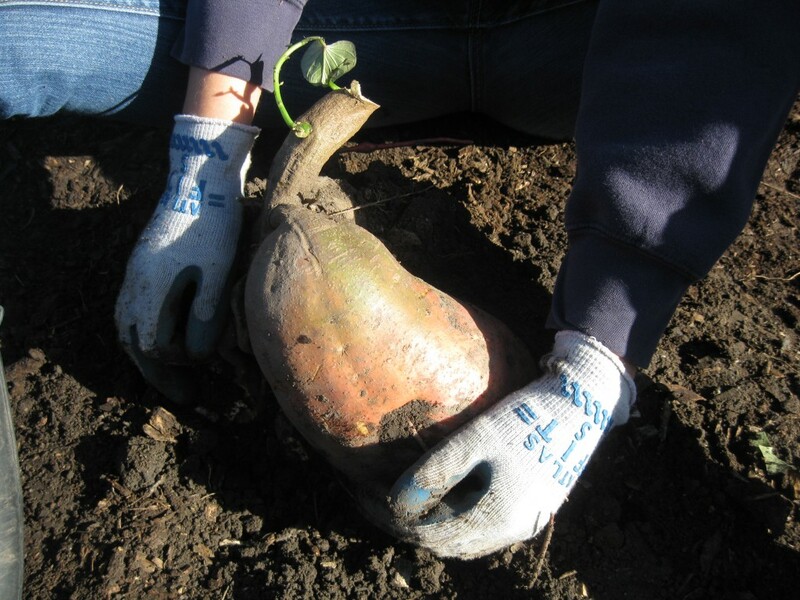 Return to Anne’s “Back to Eden” garden: oh, the sweet potatoes! My friend Anne conducted a brave and ambitious experiment this spring: she and her family set up her garden with a thick wood chip mulch which covered a layer of cardboard and newspapers. 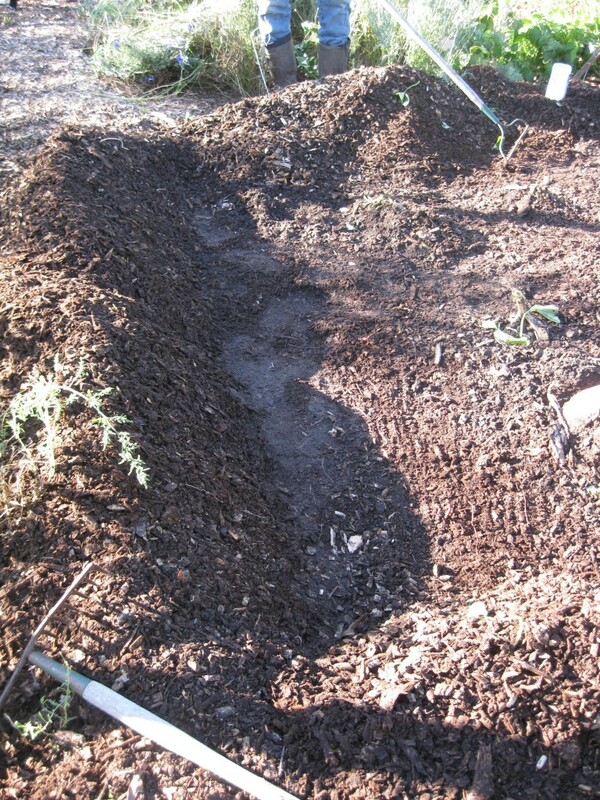 She learned about this technique through this website, where Paul Gautschi does a great job of explaining this very deep mulch kind of gardening. You might want to check out that post. It and will perhaps get you to think about searching out vast quantities of woodchips and newspapers right now to have ready for next year’s garden. Especially when you see the pictures of Anne’s sweet potatoes. That is, if you like to grow your own sweet potatoes. Which you probably do if you’re reading this post. I wrote that post in late August, that wearisome time in Nebraska when most gardeners have been engaged in major battles against ragweed, buttonweed, bindweed, creeping Charlie, dandelion, milkweed, dock weed, and invasive grasses, and beginning to lose the war. I seem to have gotten the timing just right on that one, because it’s still one of my highest-viewed posts. The message came through, loud and clear: I’m not the only person who struggles with how to keep those weeds out of the garden! Anne had mentioned earlier this summer that she was really surprised by her sweet potato plants: they were blooming to beat the band, and she said that the only thing she could find out about that strange phenomenon (neither of us have ever seen sweet potato blossoms before) was that the plants were “very happy.” I asked her to let me know when she and her family dug up those happy sweet potatoes. I wondered: would the crop that they produced also support the hypothesis that they were quite content? Or would all the abundant leafiness and flowering on top of the soil translate into not much happening underneath the soil? Now you’re curious about it, too, aren’t you? 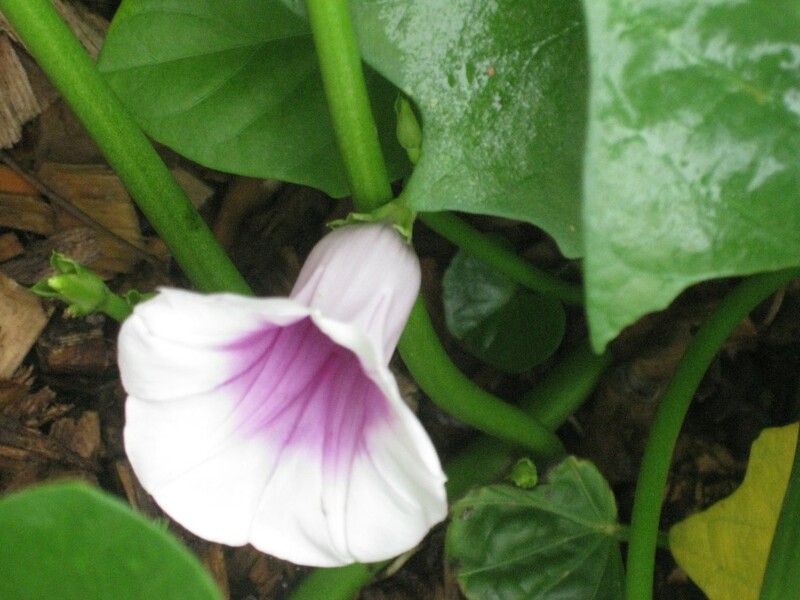 Here’s a blossom from one of Anne’s happy sweet potato plants. Well. Guess what? No. I won’t tell you. I’ll show you. Watch me now, being quiet. Getting out of the proverbial picture. Holding my tongue. Figuratively, not literally. Quiet. As. A Mouse. Starting . . . now! Here are the pictures that Anne shared with me (and thanks again, Anne!). First, here are the very lush and lovely sweet potato plants, next to some gorgeous salmon pink zinnias. That is just one row of sweet potatoes, folks. Obscure note: I was with Anne when she bought the seeds of those zinnias. Anne and her good husband Boyd were pretty curious about what was underneath those beautiful plants, and one night they had enough time to dig just one plant. This picture below is what they found underneath that one plant. Cowa-bunga. These sweet potatoes are just perfect: clear-skinned, nice sized, just lovely. Anne sent me an e-mail that evening and said that so far, the sweet potatoes looked very good, and that they had weighed one of the biggest ones, and it weighed 4 pounds! That’s a very big sweet potato. Here’s just a portion of the harvest. Anne said that there were all sizes of sweet potatoes, but that predominantly they were big and beautiful and uncharacteristically plenteous. So the plants had been happy, above the ground and beneath, as well. Very happy. 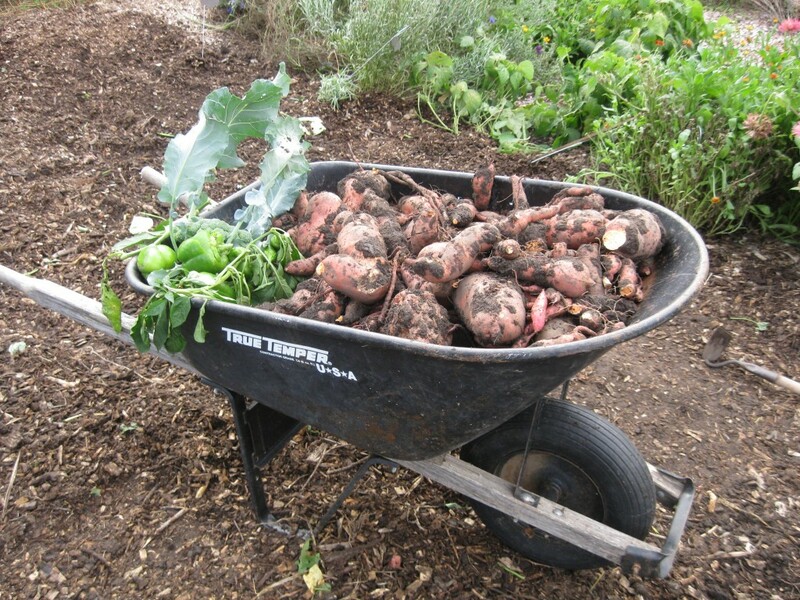 Happy enough to produce piles and piles of sweet potatoes. Then Anne sent me an e-mail to say that they had just dug up a hill that had a sweet potato that she was sure was twice as big as the 4-pounder. Twice as big? Crazy! I waited, with baited breath, as it were, for more information. Here’s the Grandpa Sweet Potato. I don’t think I’ve ever seen a sweet potato that big before, although my dad has grown some nice-sized ones. That’s one big sweet potato. It was quite a feat to dig up this monster. Here’s the trench, empty now of all potatoes. After the harvest was done, Anne and her family went about getting the area ready for next year’s planting: filling in the sweet potato trench with dirt, and then covering it with a thick layer of fresh woodchips. When the task was done, there was a bit of time left for hugging and mugging for the camera. Here are Anne and Boyd’s two cute girlies. Although the pictures tell the tale nicely, I asked Anne a few questions, just because I have an inquiring mind, and I thought that you have one, too. Question: How many pounds of sweet potatoes did you get from that one row? 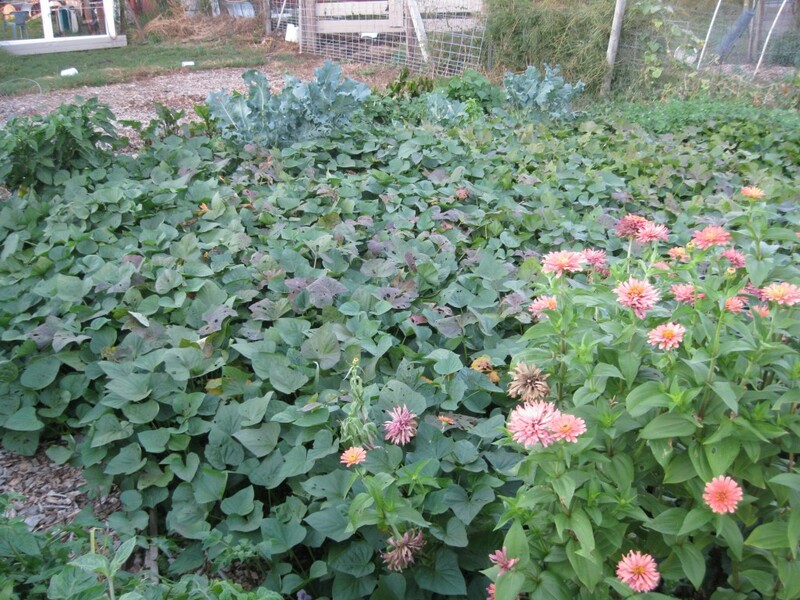 Question: Now that your garden is harvested, how do you prepare your “Back to Eden” garden for next spring? Question: Do you have any advice to others who are interested in starting their own “Back to Eden” garden next year? Question: Any other insights or observations you’d like to share? Question: So, do you and Boyd and the girlies hire out? I’ll be sharing this post with The Prairie Homestead and Frugally Sustainable blog hops, just because I’m a sharing kind of a gal. Join us! Tagged on: "Back to Eden" film, "Back to Eden" gardening, Back to Eden garden results, Does Back to Eden gardening work?, how to grow sweet potatoes, Paul Gautschi's Back to Eden garden results, Paul Gautschi's wood-chip mulch gardening, review of Back to Eden gardening, using mulch in the garden, why do sweet potato plants bloom? Great Article and pictures as well as advice. I only had one thought. There must be some pretty loud mice in your area. Now I am expecting to see some very special sweet potato recipes, that we don’t see every day. Type quietly, I’m still sleepy. Thankfully, there is a farm not far from here that sells big boxes of sweet potatoes for a most reasonable price. Which I then take home, clean up a bit, and keep in a cool, dark, dry place… To afford me those scrumptious delights for almost a quarter. Alas- then, I must resort to the local grocer to obtain their third cousins, once removed. Good for you, Roy! Sweet potatoes are so nutritious. 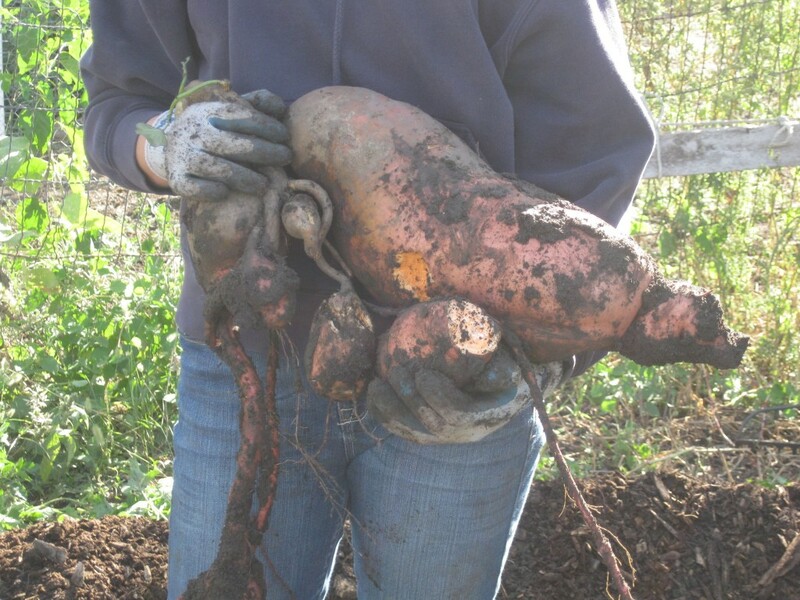 That 9-pounder could keep you in daily sweet potato for a week! wow wow oh wow. Those are some huge sweet potatoes. I guess that the garden trick works. I wish I could be more of a gardner. My mom and her husband had a huge garden and she would always give us fresh veggies. I cant garden because I live in an apartment so I go to the farmers market. The farmer’s market is an excellent option, Renee! Great pictures, thanks for sharing. I would love to do something practical with our garden and grow our own vegetables but we rent and can’t get the permission from the landlord. It’s really annoying but just another reason to save up for a house. OMG that’s amazing!!! Whenever I see posts like this, I am completely inspired to grow my own veggies/fruits! I would love to grow pumpkins and spaghetti squash – would save me lots of money! LOL! Too bad I have no backyard… I don’t think growing them in a pot on my balcony is a good idea! Looks fantastic and you always give great advice! That is a sweet potato and a half…. it’s HUGE ! Isn’t it amazing, Sophie! Several meals’ worth in that spud! I got my ginger at my local market. I was told that it was an Indian ginger. Pretty light and pink. I dug it up Sunday and got a lot for my first year. I turned around and put some of the fresh new ginger back into the ground. I was so wonderful digging it up and smelling it. The little things in life! Can you share this with me: are you planting your ginger now? And do you live in a cold winter area of the world? I’ll plant garlic this weekend, and it will be fine in the ground over the winter, being the first thing to pop out of the ground in the spring. Can you do the same thing with ginger? Yes, I live in Northern Florida. I’m a new gardener of 4 yrs. so I’m learning. Our winters are nothing like yours however, last night it was 34 deg. I think because I just picked it (otherwise it will get mushy), it will stop it from growing and it probably won’t start growing again until spring when the ground warms up. I put a ton of woodchips on it and I think that’s why it did so well and a tad of 10,10,10 (that’s what I had) being the first year I’ve done ginger. Give it a shot, if you get a hold of some and plant it in the early spring. Just put sm. chunks with eyes about 3-4 inches deep and see what happens. Then pick before the first frost when frons turn yellow. Mmm…I can taste it now, crystalized ginger! 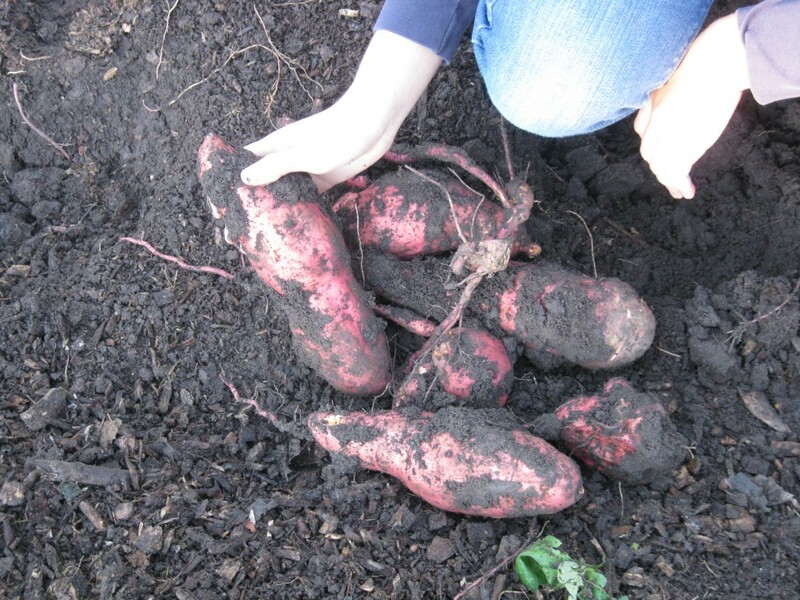 PS…Dug up my sweet potatoes and they were beautiful! Not as big as your friends but nice sizes. Two buckets full…not bad for a small patch! I did my garlic too and it’s already popping out of the ground and I put another layer of woodchips on it! Keep warm! Good job on the sweet potatoes! Mine didn’t do so well (it was in the . . .erm, . .. the weedier part of the garden) but my friend Anne shared a few of hers with me. So good! Hi Amy, I got my ginger from the farmers market from someone who grows it. You could try and plant some now and then some in early spring and see which one comes up and works best. 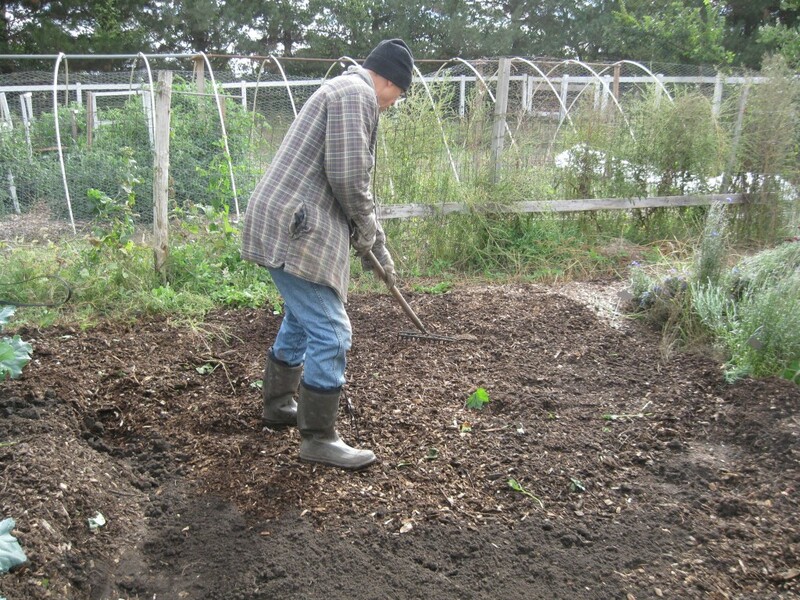 I would use woodchips heavy on it as it will keep the ground warm in winter and cool in summer. Yes, I saw your crystalized ginger recipe, (I’m the cookinmom comment re: eating so much my nose runs :). Glad to hear you did get sweet potatoes as they are so good. Will have to look around for a sweet potato pie recipe as I have never made one. Think about this, Rose, Sweet potato pie with a bit of ginger in it! Yum! Ohh…you are too smart! I will have to try it & let ya know! Tks! Fabulous pictures Amy and what a simply wonderful blog today, so many things to take in. Sweet Potato Pie? Stew? Soup? Curry? Yum, yum, yum, Anita-Clare, I do have a recipe for an African sweet potato and chickpea stew . . .
Love your pictures and the size of everything….I wish I was there to grab some! The Back to Eden method is what I’ll be using next year where ever we end up. 🙂 Thank you for sharing the information from your friend! You’re welcome Sabrina, and good luck! Good for you, Julie! Doesn’t that film just make you want to collect yourself newspapers and wood chips and just start a Back to Eden garden? And I agree with you about the balcony garden. I’ve lived in apts before and always, always had something growing out there on the balcony–there are tomato plants bred to be grown in pots and I grew those, and herbs, lettuces and other things. My daught-in-law has a wonderful balcony garden, all planted in pots. So it can be done. I’d love it if you kept me posted about your progress on this, Julie! If that doesn’t convince you to do a BTE garden, nothing will! Yes, I have sweet potatoes in the ground with woodchips and we dug a few up two weeks ago that are a very nice size. We decided to water them and wait. Will be digging them up this weekend 🙂 Can’t wait. Make sure you wait 2 weeks so they will sweeten up before you eat them. I live in North Florida and they say you can only grow ginger in the tropics. Boy does the BTE method prove them wrong! I have learned to throw out the books and just cover with woodchips and watch it grow! My ginger is gorgeous and I’ve been breaking off a piece here and there when needed to cook with! I’m excited to dig it up being the first time I’ve ever done it. I could go on and on…so don’t hesitate to put 4 inches of chips on your garden now, while it’s cool out and then figure out what to plant later! It will always be waiting! Enjoy your fall garden!! THanks for those tips, cookinmom! I’m going to do just that, gather up woodchips right now to cover my garden with. Where do you get your ginger rhizomes? Oopps…I put my reply under Sophie, sorry! Wow, I am so excited to hear someone has done this. I have watched Paul’s video and looked at all his YouTube stuff, and am soooooo excited to start this. I have this perfect little area……..
Well, as I was closely watching Paul’s YouTubes, I heard him say that he has subterranean water on his property. Now that helps bunches, and he lives in Sequim, WA, and he doesn’t have the hot Texas sun! However, I know that the water consumption will lessen greatly. I am going to try putting this right over my existing raised beds and see what happens. Also, this year I had a sprouting sweet potato on my kitchen counter from the potatoes grown last year. I cut it into quarters and planted it in one of my raised beds. It grew like crazy and we harvested 85 pounds of potatoes from the one. We would have had much more, but we got caught with an early freeze that killed off all the leaves (do you know they are edible?) and after a few weeks, we dug up what we had. Of course, without the last couple months of growing, they stayed much smaller than the year before, but they still are enough for eating, canning, dehydrating, and freezing. Also, we share with sweet potato-loving friends. Now I am ready to begin a whole new adventure into the sweet potato world. It may be the answer to a starving nation one of these days. We better figure out how to grow them well. BTW, I found this wonderful source of mulch! I talked to a Master Gardener here in our town, and he told me about a part of the county that accepts all the wood and landscape refuse from anyone wanting to drop them off for free. They have a huge chipper/shedder and grind it all up, then let the community come and get the finished product – FOR FREE! Can you imagine? I am getting my husband to help me bring home trailer-fulls of this stuff and start my compost piles. Did you see the ones that Paul has on his place? I need some like those, too. Along with my chickie poo, we will have the best garden this next year! WOW, Mari. You cut the sweet potato into quarters and planted it in your raised beds and got 85 pounds from one potato??? That is just awesome! And no, I didn’t know that sweet potato leaves were edible. I know my friends raise their own slips by putting sweet potatoes into jars of water. I’m going to grow more sweet potatoes next year! We’ve eaten just tons of them this year (not literally) and I love your super-thrifty way to get starts. Mari, our little town has a small dump area where the city workers chip up brush all summer long, and the chips are free for the hauling, but there is lots of competition for them! (Too many people reading about Back to Eden gardening, I think!!) Good luck getting those huge piles! Send me a picture if you get a nice pile, I’d love to see it. I’m going to be working on making a nice big pile here, too, as soon as the weather warms up a bit (around 0 today, alas). Blessings! Yes, they actually sell sweet potatoes leaves here in North Florida for the locals at the farmers market. Very expensive…$7 a pd. Never tried them though. They are a delicacy for the locals. They also eat the leaves from sugar snap peas. Mari, stick with it and don’t be discouraged, it takes time for the woodchips to break down. Don’t listen to those that say woodchips cause root rot, too much this and that etc. They have never done it. I’ve only done it for less than a year and you would not believe the size of everything. Huge snap peas, green peppers as tall as I am etc. I can’t wait to see how my carrots do this year for the first time. My garlic is beautiful and radishes are doing well. The most beautiful strawberries I have ever seen. We put woodchips on our blueberries and they have grown almost twice as big in less than a year. Be patient and just make sure that you continue to have 4 inches of woodchips on everything. Happy New Year and gardening! Thanks for this encouragement, Rose. Any hints on how to get that many woodchips? My biggest challenge is just hauling enough of them to have that nice of a layer. Excellent!! I’m going to get on the ‘phone tomorrow and see if I can rustle up me some woodchips! I do have one tree trimmer in the area who occasionally brings me a load (like, maybe once per summer) of firewood and chips, but not nearly enough. We do live in the sticks, but are just around the corner from the area landfill (alas) so it should be on the way for some of these companies, heading toward the dump as they may be. Thanks for the idea! You’re brilliant!! Just make sure that your chips have green leaf matter in it. That’s the live organic that will break down. (Solid woodchips not so great) Sometimes, on the way home from errands, I will be behind a chip grinding truck full of chips. I am so bad that I will follow trucks and ask them for their load. The things us gardeners do to seek out gold! Once I got a load from a pine tree that they cut down and I use it for my blueberries. Blueberries Looove pine. My girlfriend who is a master gardner, said her friend did her masters thesus on what do blueberries like most. Yup, pine so I layer with chips. Happy hunting!!! Rose, are you in Texas? I’d like to hear more about your blueberry growing tips. Have you read my take on growing blueberries in Nebraska? Here it is:http://vomitingchicken.com/how-to-grow-blueberries-e/. We don’t have the soil that blueberries like, but we’ve found a way around that. I love your story of following a truck full of chips around. You’re my kind of prairie woman, I tell you! It won’t be long now–spring is coming, it is, it is–before I’ll be waking up before dawn with nothing on my mind except amassing huge amounts of MULCH for my garden, hopefully woodchips. I do have a few bales of hay from our grass cutting this year, but I’ll be on the hunt for woodchips very soon, too! Also, forgot to mention, the utility companies trim trees mostly in the summer but not much in the winter. I’m usually high and dry in the winter. That could be the title of a book, Rose. “High and dry without Woodchips in the Winter” by Rose. Presumably you’re not doing a lot of gardening during this weather, are you?? But where are you located? Is it warm there–please say YES and I’ll come visit you. Now. LOL! Your too funny…book??? No, I threw out all my books on gardening and I’m sticking with the BTE. I was out in the garden just a few hours ago. I believe it was a high of about 66 deg. today. I had to thin my spinach and pick my lettuce. My snap peas are peeking up and kale is getting bigger. Tried to lay some chips down on strawberries with some hay as it’s going to be 19 deg. tomorrow night. (Please don’t tell me how cold you’re going to be!) They actually had fruit on them. They are just absolutely beautiful and green. Because of the BTE garden, it pushes everything to the limit. My neighbor and I garden together mostly in her garden as it is bigger. I call mine, my “sandbox” that I play in. Sorry, no tips on blueberries other than HEAVY covering (chips) on your blueberries for a few years and you will be in awe! You think they are big now, try it! 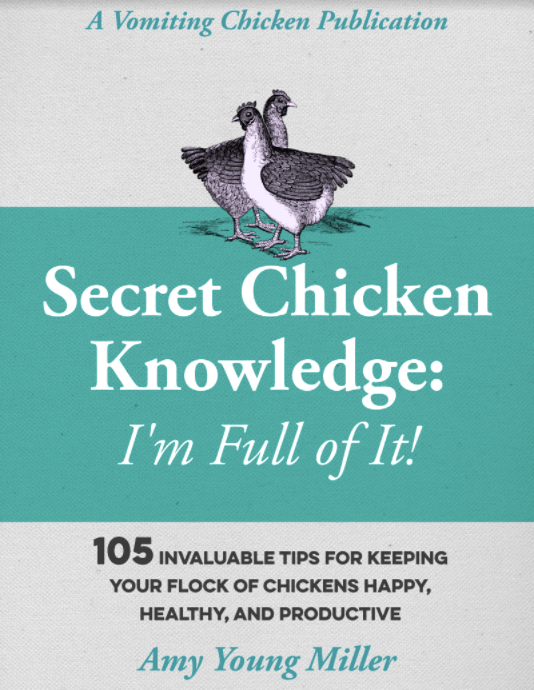 (Add some chicken gold to it too!) I did it with my neighbors as they were so sad looking. She couldn’t believe it. No, I’m not in Texas but Northern Florida. I use to live in South Florida but love gardening here! You have a beautiful garden according to your pics. Make sure they dump those chips almost in your garden, so easy to spread that way! Stay warm! Blessings! Rose, I’m so glad we’re friends! I would absolutely love to see pictures of your gardens! And I appreciate your sharing your gardening experiences with me. Are you able to garden year-round, or do you have a winter cool down there? I’m a new gardener so cool down, I guess, means nothing planted (put to bed) in the garden during the winter and a covering is put in place? Right? If that is the case, yes and no. We put down clover in 1/2 garden and plant winter veggies (cabbage, cauliflower, brussels sprouts, kale etc.) in the other 1/2 only because my neighbor is NOT totally convinced about the BTE style gardening. 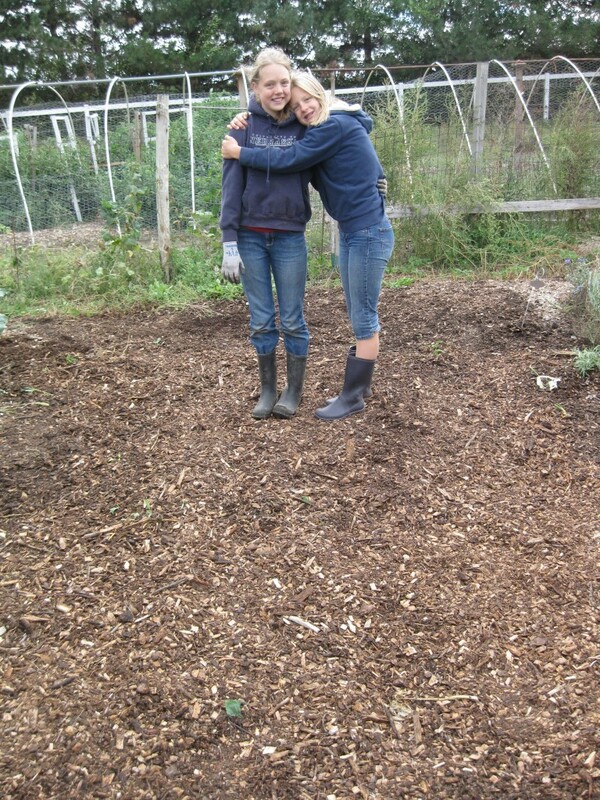 But, because of the results, she is allowing more and more woodchips into her garden! She just now accepted to try carrots so am excited to see the results! They, so far, are the greenest she has ever had them. I just put woodchips down and believe! One more thing, I promise…as Paul mentioned in his clip, http://www.youtube.com/watch?v=d-fW4_rEpsI , try maybe next winter and plant some kale under a BIG tree and see if it will hold out, as an experiment. You would probably need to put down quite a bit of mulch to keep ground warm. My neighbor is underneath a covering of huge trees and none of her crop froze here in N. Fla., however, my girlfriend in Gainesville had hers freeze as she doesn’t have trees around her garden at all. Try it, what have you got to loose…just a thought! I had quite a large kale patch until a heavy freeze got it. Even the kale in my hoop house wasn’t a match for -15!! But this is an excellent notion, to locate a few plants under a tree (and then perhaps to snuggle hay bales up against it for additional protection?) and see how it goes! THank you and I never get tired or your comments, keep ’em coming! As I mentioned calling the utility companies, also try calling your guy that brings you chips once a year. Planting the bug in their ear (no pun intended) to remind them always helps. You may have to call the tree trimming services as well during the summer. This may seem too much, but, if you really want that gold, go to the dump around 4P and talk to the men that work there and ask when the trucks come that dump chips (if they do). I’ll bet it’s around 4p. They dump early so they can go back to home base and leave to get off by 5P. Happy hunting! I know this is an older post, but wanted to comment on Back to Eden method. I live on the West side of Albuquerque, NM, and the ‘soil’ in my yard was pure dead sand. This method allows for conservation of water, and a prevention of salt buildup on the land. We get between 8 an 10 inches of rain in a year, so water is precious. I’m hooked. Does that mean that you’ve employed the “Back to Eden” method? I’d love to hear more about your experience. 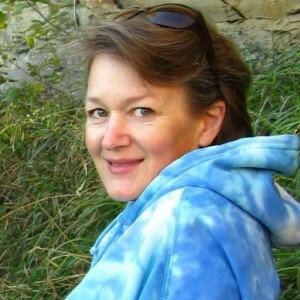 Just signed up to follow your blog! I have just learned a little about BTE gardening this morning, and want to learn more. I have especially enjoyed Rose/cookinmom’s comments since I too live in North Florida. I have grown ginger in pots for years, but only for their beautiful big leaves and gorgeous flowers – never occurred to me to harvest them! We have huge semi-tractor trailers on our roads here all the time, hauling wood chips…to the local paper mill. Probably a BTE gardener’s dream…and nightmare! Whoa, Pat, I’m totally jealous. Have you asked if they would stop and dump a load at your place? ?